The Economic and Financial Crimes Commission, EFCC, today signed a Memorandum of Understanding, MoU, with the International Police, INTERPOL as part of collaboration aimed at tackling corruption in Nigeria. communications system that connects law enforcement officers in all member countries and enables users share sensitive and urgent police information with their counterparts around the globe, 24 hours a day, and 365 days a year. 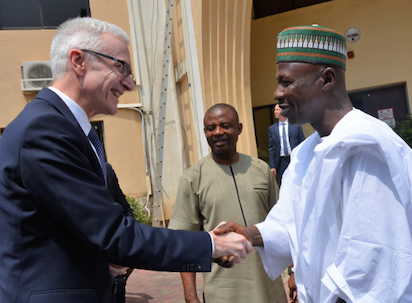 While receiving the delegation led by Commissioner of Police, Shola Subair, CP INTERPOL, at the EFCC Headquarters, Jabi, Abuja, the Acting Chairman, Ibrahim Magu, expressed his appreciation for the initiative, which he said will go a long way in checkmating the activities of fraudsters across the globe and Nigeria in particular. The MoU, according to Magu, will further create a greater technical team work and allow the EFCC to be connected to the 194 member countries of the organisation. He stressed the need for EFCC staff to be seconded to the Interpol. He used the opportunity to explain how the Data base can be used in tracing the movement of looters in an out of the country and also how this collaboration will give EFCC access to the 194 member countries of the Interpol. â€œAll sort of criminality is taking place and looters are everywhere, now that the EFCC is going for extradition of looters outside the country, there is no better time than now, EFCC will use it opportunity judiciouslyâ€, Magu said, adding that the MoU will strengthen the EFCCâ€™s efforts in areas of monitoring illegal assets. He further added that, with the elections fast approaching, â€œthe EFCC is on the watch out. We would not fold our hands and allow people move illicit funds indiscriminately in the name of vote buying. Nigeria is blessed with both human and natural resources. It is high time the generality of Nigerians get rewarded for God given natural resources that are aboutâ€. Subair, who led the delegation, stressed the importance of the INTERPOL, EFCC partnership, as it would further strengthen the anti-corruption efforts of the anti-graft agency.